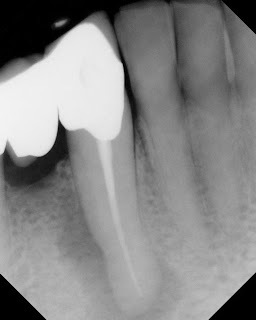 This is a typical case of endodontic healing. This tooth was diagnosed with a necrotic pulp & chronic apical periodontitis. The periodontal probings were normal. 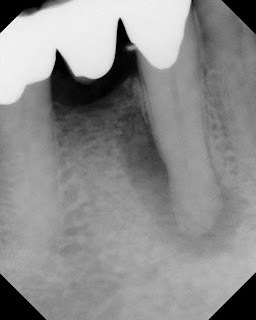 The apical lesion was very large and extended up the lateral side of the tooth. This could be described as a "J-shaped" lesion which is sometimes indicative of a vertical root fracture. 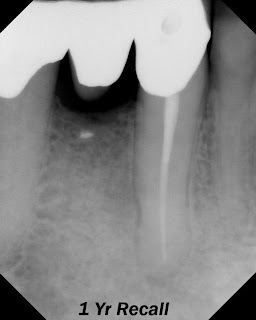 Since the perio attachment is normal, this is diagnosed as purely an endodontic lesion. At one year recall, the lesions is almost completely healed. 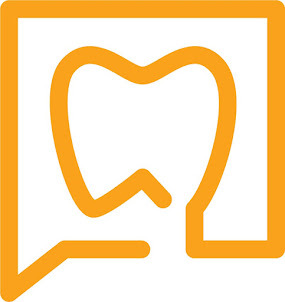 The periodontal probings are normal and the patient is completely asymptomatic. Proper endodontic diagnosis & treatment not only saved this tooth, but saved this bridge as well.